C. Han, R. Lakshmanan, B.R. Bakshi, and G. Stephanopoulos, Nonmonotonic Reasoning: The Synthesis of Operating Procedures in Chemical Plants. P.M. Saraiva, Inductive and Analogic Learning: Data-Driven Improvement ofProcess Operations. A. Koulouris, B.R. Bakshi, and G. Stephanopoulos, Empirical Learning through Neural Networks: The Wave-Net Solution. B.R. Bakshi and G. Stephanopoulos, Reasoning in Time: Modeling, Analysis, and Pattern Recognition of Temporal Process Trends. M.J. Realff, Intelligence in Numerical Computing: Improving Batch Scheduling Algorithms through Explanation-Based Learning. References. Subject Index for Volumes 21 &22. Contents of Volumes in this Serial. 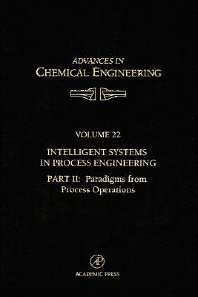 Volumes 21 and 22 of Advances in Chemical Engineering contain ten prototypical paradigms which integrate ideas and methodologies from artificial intelligence with those from operations research, estimation andcontrol theory, and statistics. Each paradigm has been constructed around an engineering problem, e.g. product design, process design, process operations monitoring, planning, scheduling, or control. Along with the engineering problem, each paradigm advances a specific methodological theme from AI, such as: modeling languages; automation in design; symbolic and quantitative reasoning; inductive and deductive reasoning; searching spaces of discrete solutions; non-monotonic reasoning; analogical learning;empirical learning through neural networks; reasoning in time; and logic in numerical computing. Together the ten paradigms of the two volumes indicate how computers can expand the scope, type, and amount of knowledge that can be articulated and used in solving a broad range of engineering problems.